Our second semifinal match in Bracket One of the Battle of the 2013 Books features Burning Paradise by Robert Charles Wilson going against The Cusanus Game by Wolfgang Jeschke. In the semifinal round, the books are judged after reading a total of 100 pages. The winner, the book I (Jackie) most want to continue reading after 100 pages, will advance to the championship round. 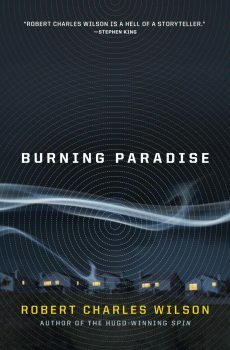 Burning Paradise: Tor Books; November 2013; 317 pages; jacket art by Getty Images; jacket design by Base Art Co. Robert Charles Wilson has written many science fiction novels including Darwinia, Julian Comstock, Blind Lake, The Affinities and the Hugo Award winning Spin. He has won various awards. Burning Paradise overcame Trinity Rising by Elspeth Cooper in the first round, and got by Shadow People by James Swain in the second round to reach the semifinals. In the first 50 pages of the alternate reality book Burning Paradise, we meet 17-year-old Cassie and her younger brother Thomas who must both flee the apartment they share with their Aunt Ris because a simulacrum, a human-like robot, seems to be after them. They escape to 21-year old Leo Beck's apartment. Leo, his girlfriend Beth, Cassie and Thomas drive out of the city, hoping to get to Leo's father's home. Werner Beck is a leading member of the Correspondence Society and he'll know how to help. Cassie's parents, seven years earlier, were killed by simulacrums because they were part of the Correspondence Society (CS), a group that discovered the truth about the sims. Meanwhile on a remote farm, former University Professor Ethan Iverson has captured a simulacrum (sim) that came to his door and wanted to talk to him to explain more about the radiosphere. But Ethan doesn't believe the sim. Soon another knock on the door brings Cassie's Aunt Ris, who is Ethan's ex-wife Narissa. Ethan has duct taped the simulacrum to a pole in the basement and told Narissa that the sim mentioned their niece's name "Cassie" and they need to figure out why it knows about her. In the second 50 pages, Ethan and Narissa hear an alarm, letting them know more simulacrums are on the property. Ethan manages to kill two of them, but the third enters the farm house. It shoots the taped-up sim in the basement but doesn't manage to kill it. Ethan and Narissa patch up the injured sim, put their necessities and the sim in the truck and take off. The sim tells them that it is part of another group of sim entities. Ethan knows that people can't trust sims because they operate as a hive mentality, like ants in an ant hill. Meanwhile, Beth is causing problems for Cassie's group, including making a phone call that probably blew their cover. When they reach Werner Beck's house, he's not there, but the young people find information that tells them what to do next. The Correspondence Society discovered that the radiosphere, which is a layer of the atmosphere that reflects radio waves around the world, is actually made up of trillions of intelligent spherules. The CS discovered that the hive-like spherules sometimes alter communications, sending fake messages back to Earth and deleting others. This interference has altered more than communications. Because the spherules have been deleting or altering war threats, Earth has had no war since Armistice Day 1914, which was 100 years ago. The CS believes these manipulations must end. The spherules created simulacrums to roam the Earth to kill Correspondence Society members to keep the knowledge of their sentient existence and interference a secret. Ethan's sim now claims that it is a part of another group of entities that is fighting to kill the radiosphere spherules and needs the CS's help. But is this sim telling the truth or is this part of the radiosphere's plan? 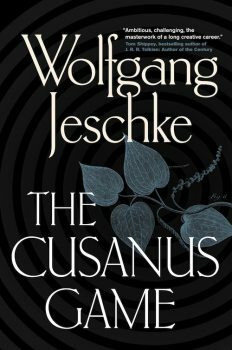 The Cusanus Game: Tor, English translation September 2013; originally published in 2005 in Germany; 538 pages; translator: Ross Benjamin. Wolfgang Jeschle was a German science fiction writer who also wrote Last Day of Creation. The Cusanus Game overpowered The God Tattoo by Tom Lloyd in the first round, and won a decision over The Doctor and the Dinosaurs by Mike Resnick in the second round to reach the semifinals. The prologue in The Cusanus Game takes place in 1425. Caravan leader Emilio trades supplies such as spices, coffee, tobacco and cocoa with the "future" people, who then give Emilio medicine, vaccines, and solar technology to name a few. During one of the exchanges, some of the caravan young men try to enter the "future" compound but are wounded or killed. Bakhtir loses his son and feels so distraught he tries to kill a future person, who is actually a hologram, and the bullet damages the "airship." Emilio and Bakhtir barely escape certain death. Moving forward over 500 years, Domenica is a botany student at a university in Rome. The time is 21st century after Europe has been contaminated by a nuclear world war. War continues with various factions fighting and committing murderous attacks on civilians. People are trying to survive while avoiding the ravages of fallout and uncertainty. Mutations, both manmade and genetic from radiation damage, abound, and with those modifications come biases, prejudices and hate. Domenica's Siamese-twin friends were chillingly murdered by a Nazi-like hate-group. Domenica came across a modified dog, created with human genes used to add some intelligence and the ability to talk, but also programmed to die after a certain time period. Living in Rome after the European apocalypse is rough, violent and scary. Still, Domenica and her friends continue to survive, going to school and securing jobs. After graduation, Domenica and some friends have applied for a position with Rinnascita della Creazione di Dio. Five graduates get the job but don't know to where they are traveling or what they will do when they get there. The five traveling to Amsterdam are three botanists, a theoretical physicist, and a specialist in medieval history. All they know is the jobs have something to do with the "Salvation of God's Creation, the salvation of the future." The 100 pages of reading ends back with the prologue's two characters Emilio and Bakhtir, right before they bring their caravan goods to the barters from the 21st century. Bakhtir's son is still alive in this time jump. The Battle: This semifinal match-up of Battle of the Books features the alternate history science fiction book Burning Paradise trying to best The Cusanus Game, a futuristic science fiction novel that involves nuclear disaster and time travel. Burning Paradise offers an interesting concept of alien life forms. In this case they are tiny spherules that have a hive-like mentality and surround Earth above the atmosphere. Scientists say that life off planet will probably be totally different from what we might expect, and this fits in perfectly with that concept. By the end of the 100 pages, a new life form shows up saying that there are many alien creatures that travel from solar system to solar system with the purpose of using resources on other planets and to reproduce. I'm curious to see how the characters treat this new information. Is it real or are the aliens feeding false information to the Correspondence Society? The Cusanus Game begins immediately with time travel, for the purpose of gleaning items from the past to supply future Earth with what they need to survive after the nuclear war. The major part of the 100 pages follows Domenica, but we jump through time with her past and present to discover her situation and the world news. The jumps became confusing at times, and the details of the war came in bits and pieces that made the reader work to figure things out. In the last 20 pages, the story does not jump around as much and stays in the present time period for longer than a few pages, which makes me enjoy the story more. I enjoy both books' writing styles. The Cusanus Game seems to be on a higher literary level, or maybe I'm finding it a bit harder to follow since many locations are, of course, written in Italian. The story seems believable and gritty. The descriptions leave me feeling war weary and drained. I do see some hope with the characters and their new jobs that will most likely propel them into other historic times. I (Jackie), after reading 100 pages of each book, must make a difficult decision. I'm especially interested in reading both books and will probably do so after the final Battle of the Books. The winner was only decided when I reached page 80 and farther in this book. The Cusanus Game advances to the championship round to face The Best of All Possible Worlds by Karen Lord. Our first semifinal match in Bracket One of the Battle of the 2013 Books features Electricity & Other Dreams by Micah Dean Hicks going against The Best of All Possible Worlds by Karen Lord. In the semifinal round, the books are judged after reading a total of 100 pages. The winner, the book I (Jackie) most want to continue reading after 100 pages, will advance to the championship round. Electricity & Other Dreams: New American Press; May 2013 (the collection of 26 stories were published individually from 2010 to 2012); 224 pages; cover design and interior art by Liz Green. 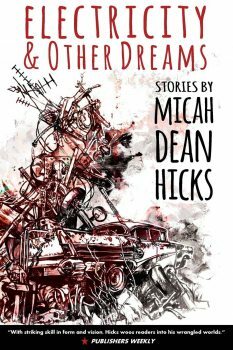 Micah Dean Hicks writes "magical realism, modern fairy tales, and other kinds of magical stories." Electricity & Other Dreams got past The Returned by Jason Mott in the first round, and edged by Fiend by Peter Stenson in the second round to reach the semifinals. After reading 50 pages of short stories in Electricity & Other Dreams, I met alligator men, chickens who ran a meth lab, Lijah and his car, a contractor with a jinn ring, a plumber ghostbuster, and a man who lived in cans. The second 50 pages brought us more fantastical tales that twist and turn in magical directions. "How the Weatherman Beat the Storm" -- Carlos drives the van that takes the TV camera crew to their various locations. The "weather girl" is beautiful and Carlos can't take his eyes off her. One day he ends up on the smoking balcony with the weather girl. He tries to impress her and says he has always wanted to be a weatherman, which is a big lie. The weather girl says, really? He says yes. The weather girl brings down a storm cloud onto his back. She tells him that when he can make the storm go away, then he'd be a real weatherman. Carlos's life just got complicated. "The Famine of Music" -- A beautiful inventor uses her beauty to lure people to her home so she can experiment on them. She's changing their ears to ones made of satellite dishes, ear buds, guitar strings, and trumpet valves. Men and women let her alter their ears and forgive her, probably due to their weird attraction to her. The modified people, who soon number in thousands, find that "Everything is music." Seven brothers sit on a cliff and listen to the sound of waves crashing on the rocks. Sadly, the sound is music and not waves. They go into town to find the missing sound of waves, which happens to come from the mouths of whores. "Keep talking," say the brothers. Then a mariachi band rolls into town. "The Butcher’s Chimes" -- An old woman who makes chimes is raising her deceased daughter's nine kids. She takes the kids to the dump where they find old appliances or craft pieces that the old woman can fix and sell or use to make chimes. The woman takes the fishing line and wire and runs it through her teeth to make it straight, and anything she strings seems to come to life. A meat fair comes to the area. The old woman tells her grandkids to line their pockets with plastic bags and newspaper. They will go to the fair and steal meat and put it in their freezer. At the fair, "The Cleaver" watches the kids steal meat. He keeps track and will get his money's worth when the time comes. As the woman and kids put the meat in the freezer, she sees that she only has eight kids. She goes back with the oldest kids to look for the missing girl. Meanwhile the other kids take the meat and string it together into the shape of a boy they call Pigboy, and he comes to life. "The Hairdresser, the Giant, and the King of Roses" -- Marti is a high school scientist, building dangerous science projects. Great things are expected of her. A witch visits Marti while she is packing for college. The witch touches Marti on her head and steals Marti's charmed life. The witch goes to college, and Marti becomes a hairdresser, but she has a special power. Her fingers, running through people's hair, change hair to gold. Her business flourishes while the witch enjoys all the things Marti was supposed to have – fame, money, self-fulfillment. Ricky Long is a tycoon. He has a wife and seven daughters. Every couple of months, he brings his family to Marti's hair salon to have their hair turned to gold. At home, he cuts their hair of gold and sends it all to a Cash for Gold company. Ricky begins buying up the town. He surrounds every property with a moat of thorny rose bushes. He hires ten-foot-tall Bryon Cox to plant the bushes. The men who work for Ricky would like to see Bryon kill Ricky, but Ricky has a hold on Bryon. One day Marti invites Bryon in to get his hair washed and changes it to gold. Ricky sees this and cuts Bryon's hair and keeps the gold. Marti gets mad and comes up with a plan. "Bluebeard’s Daughter" -- Bluebeard likes the check-out girl at the grocery store. She eventually moves in with him. There's a locked drawer that Bluebeard doesn't want her to open, but she eventually finds the key. In the drawer are photos of all Bluebeard's past wives. Each wife has committed suicide. Soon, the grocery clerk climbs a tree and jumps, killing herself. Bluebeard is devastated. He gets married again, and this wife gets pregnant. He's so excited. Will the curse strike again? 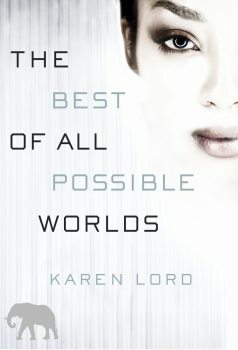 The Best of All Possible Worlds: Del Rey; February 2013; 306 pages; book design by Victoria Wong. Keren Lord's debut novel, Redemption in Indigo, was published in 2010 and won the Frank Collymore Literary Prize in Barbados. The Best of All Possible Worlds defeated 23 Years on Fire by Joel Shepherd in the first round, and overpowered The Secret of Abdu El Yezdi by Mark Hodder in the second round to reach the semifinals. The first 50 pages of The Best of All Possible Worlds find us on the planet Cygnus Beta. "Councillor" Dllenahkh, a Sadirian, is on a mission to find other humans with Sadiri genetic heritage. His own planet was poisoned, killing most of the females, since they rarely go off-planet. Male Sadiri want to find suitable Sadiri-genetic-compatible females, with which to mate, in order for their race to continue. They are telepaths. The Cygnian Delarua is assigned to travel with Dllenahkh and others to the various distant villages to do genetic testing. Discussions with the leaders of each settlement are undertaken to work out possible mating agreements. During these village visits, Dllenahkh and the team find various telepathic abilities being used. Delarua is also found to have some "psi" abilities. In the second 50 pages, we discover more about the characters. Dllenahkh needs to "realign his nodes," or something like that, at the nearest monastery since he was affected by surges of anger that were difficult to control. Delarua drops Dllenahkh off at the Monserrat monastery, and takes a side trip to visit her sister Maria and her family. Maria married Delarua's past love interest Ioan. He seems to have a hold on Delarua's mind, which is a punishable offense. When Dllenahkh, and Fergus another team member, arrive in the shuttle to pick her up, Dllenahkh feels the mind control Ioan has on Delarua. On the shuttle, Dllenahkh touches Delarua's forehead, draining the mind-hold. Delarua suddenly feels whole again. Delarua contacts the authorities to turn in Ioan, which she couldn't do until now. Delarua needs her own therapy, which Dr. Daniyel, part of their team, can perform. The group decides to split into two groups to hit more settlements. Delarua, Dllenahkh, and others travel to the next settlement on forest elephants. Along the way they must cross a rushing river. The mahout swims with the elephants and urges the others to do so, but they decide to take a rickety rope bridge instead. As Delarua and Dllenahkh cross, a surge in the river washes them off the bridge, and Delarua loses consciousness. She comes to in a hidden monastery filled with monks — men, women, and children. They are Sidiri and have surpassed the mind control that Dllenahkh's race has achieved. Delarua wonders what she and Dllenahkh should do next. The Battle: We have two different books battling it out to make it into the finals. The fantastical short-story collection Electricity & Other Dreams works its magic against the galaxy-spanning science fiction epic The Best of All Possible Worlds. Through 100 pages, I am enjoying the bizarre, varied tales found in Electricity & Other Dreams. However, the rich planet of Cygnus Beta and the variety of settlements in The Best of All Possible Worlds seems like I'm traveling to different settings and experiencing new peoples with each sojourn. Both books are written with flourish and detail and keep me entertained. Electricity & Other Dreams takes me to the world of magical realism. In "How the Weatherman Beat the Storm" we watch the weather girl as "she tumbled up into the wind and was gone." It happily reminded me of Gabriel García Márquez's One Hundred Years of Solitude when Remedios the Beauty flies into the sky holding a sheet that she was pinning on the clothesline. Just as good and just as amazing! There is humor within the stories as well as horror. Give me another short story to read! The Best of All Possible Worlds is more than a story of one race's fight to survive. The character development unfolds with each chapter. Details emerge about the world as the characters travel the planet. I find more humor with each chapter. When Dllenahkh needs to rejuvenate at a monastery, Delarua says to herself, "My God, get this man to a meditation chamber, stat!" Quite funny when reading the book! I still dislike all the names beginning with a "D." Really? We have Dllenahkh, Delarua, Darithiven, and Dr. Daniyle, who has Dalthi's Syndrome. Also, something was compared to an "Indiana Jones classic holovid." That brought me out of the story. In Electricity & Other Dreams, there were seven brothers in one short story and seven daughters in another. I wondered if the author's favorite number was seven or maybe the reference went past me. After reading 100 pages, I (Jackie) must choose which of these two well-written, romp-filled, entertaining books will go on the battle in the championship round. One book grabs my attention a bit more at this time, and I want to follow the characters on their planet-wide journey. The Best of All Possible Worlds advances to the championship round to face either Burning Paradise by Robert Charles Wilson or The Cusanus Game by Wolfgang Jeschke. 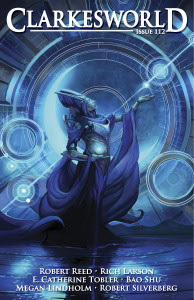 My Story Recommendation of the Week goes to "Everybody Loves Charles," a novella by Chinese author Bao Shu, translated by Ken Liu, from the January 2016 issue of Clarkesworld Magazine. In "Everybody Loves Charles," a brain implant technology called "livecast," allows the ultimate reality TV-style entertainment: people can experience everything happening to a celebrity as if it were happening to them. The most popular livecaster is Charles Mann, a brash spaceship racer, author, and womanizer. His legions of fans, including our viewpoint character Takumi Naoto, spend most of their days wired up, living Charles's life vicariously in preference to their own comparatively bland existences. "Everybody Loves Charles" moves along at an easy-to-read pace, and I found the story most entertaining. Bao Shu describes how livecasting works, both technically and socially, in extensive detail, until the story feels more believable than perhaps it should. Charles begins the story as something of a jackass, but I didn't mind, because I was pretty sure he was headed for some surprises. and because Bao Shu uses Charles's lack of self-awareness to humorous effect; for instance, when Charles earnestly lectures his audience on the importance of being true to themselves. I wasn't quite so enamored with the second half of the tale, which turns to melodrama as we learn that the creators of the livecast technology are seeking to use it to control everyone in the world and eliminate all individuality. I don't believe there really are many people devoting their days to that cause, but perhaps if I lived in China I would. Bao Shu is the author of four novels, including the award-winning Ruins of Time, and some 30 pieces of short fiction. "Everybody Loves Charles" originally appeared in Chinese in Science Fiction World in September 2014, and went on to win several Chinese SF awards. A thank you also goes to Ken Liu, who has been taking quite a lot of time out of his own very successful writing career to translate Chinese science fiction, to the great benefit of the English-speaking SF community. We hope you've enjoyed this tournament so far. Now only four books remain of the starting sixteen. This bracket contained books from across the genre. There were fantasy novels, YA fantasy, science fiction, mainstream speculative fiction, story collections and a horror novel. To get to the Final Four, these four books won their first two matches. The other books in the competition, and some of them were quite good but by chance faced a strong competitor, have been knocked out of the running, like in college basketball's March Madness. Judging between books, which can be totally different, based on reading only 25 or 50 pages can be difficult. It's also inherently subjective. But our Battle of the Books format allows us to sample and spread the word about many more new books and authors than we otherwise could. In this bracket, two of the four books which were "seeded" reached the Final Four. The unseeded books which made it to the Final Four are Electricity & Other Dreams by Micah Dean Hicks and Burning Paradise by Robert Charles Wilson. So I've been homebound for a while, recovering from a spot of surgery, and taking the chance to catch up on some of the recently published short fiction in the field. Which is to say, Story Recommendation of the Week is officially a thing again! My first 2016 Story Recommendation of the Week is for "Atheism and Flight," a novelette by Dominica Phetteplace, from the January 2016 issue of Asimov's Science Fiction. In the near future, our first-person protagonist Bos is despondent over the loss of an arm in an accident. He moves in with his best friend Jimeo and his girlfriend Cleo, who soon moves out. ("I felt like a child of divorce.") Bos determines he's not merely going to overcome his injury, he is going to transcend it. He begins to plan joining up with a group of mystical canyon-leaping daredevils. His body seems to share his fierce ambitions, as before long his arm begins to regenerate. This is a nicely constructed piece, with an elegant style and wonderful interactions between the characters throughout. I love how Bos's search for transcendence plays out through the end of the piece. 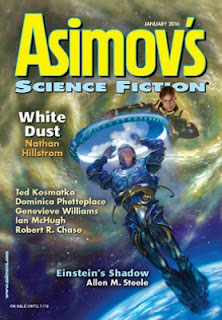 I confess I don't know much about Dominica Phetteplace, other than she is a Clarion grad, whose fiction has been popping up in Asimov's, Clarkesworld, Flytrap, and other places in the past five years. Here's looking forward to much more of her work!